1976 was a banner year for numismatics, fueled almost entirely by the excitement over America’s Bicentennial. Combined sales of regular Proof Sets, three-piece 40% Silver Proof Sets, regular Mint Sets, and three-piece 40% Silver Mint Sets reached a record sales level of almost 15 million sets (although in fairness, we should point out that the three-piece sets were sold as late as 1982). 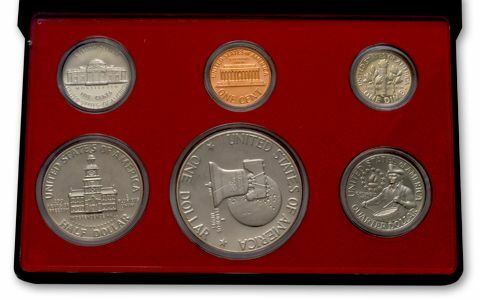 Each set contained six coins: One example each of the Lincoln Cent, Jefferson Nickel, Roosevelt Dime, Bicentennial Washington Quarter (Copper-Nickel Clad), Bicentennial Kennedy Half Dollar (Copper-Nickel Clad), and Bicentennial Eisenhower Dollar (Copper-Nickel Clad). 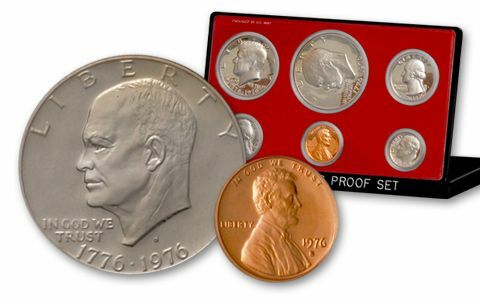 About the sets: 1976-S Proof Coins are found with Brilliant, Cameo, and Deep Cameo surfaces. All three finishes are readily available. Bicentennial Eisenhower Dollars are found with two different reverses: Variety I, with a straight tail on the R of DOLLAR. and the text is thicker, while Variety II has a curved tail on the R of DOLLAR and the text is thinner. All of the Dollars in the 1976-S Proof Sets appear to be Variety II. 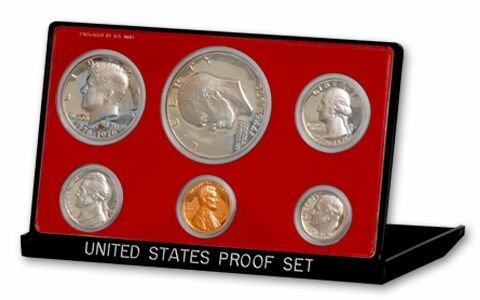 Original packaging: The individual coins of the 1976-S Proof Set were sealed in a two-piece, clear plastic case. Raised rings of plastic separated the coins from each other, and a red, felt-covered paper insert was added for visual impact. The clear plastic case containing the coins was inserted into a molded, black plastic frame with the raised silver letters "UNITED STATES PROOF SET", and a hinged flap that could be flipped over for display purposes. A black card cover imprinted with silver letters, "United States Proof Set • 1976" protected both the case and the frame.